The farm land falls down the hill into the beautiful village of Hunningham. You can walk from the site down to the pretty river Leam, which flows through the farm. 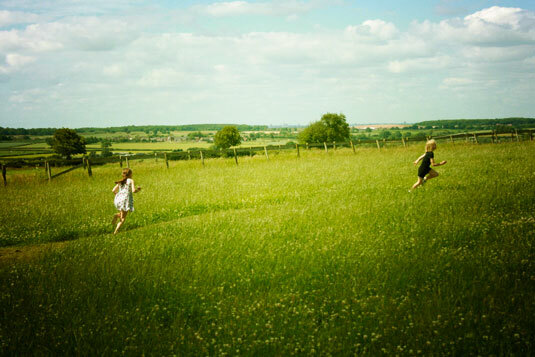 In fact there’s no end to the beautiful British countryside at your feet and ready to be explored. We can tell you the best walks and also offer farm tours. The campsite’s location is second to none with breath taking views across Warwickshire and the Cotswolds. We’re nestled far enough into the countryside to enjoy a full sky of stars, but close enough to some of the UK’s premier visitor hotspots. It’s your choice; if you want to venture out, Royal Leamington Spa, Warwick, Stratford-upon-Avon and the Cotswolds are right on our doorstep. Or, for those after complete peace and quiet, park the car and escape it all. Hilltop Farm Shop & Café offers all the essentials you need and plenty more besides – you’ll never have to leave. 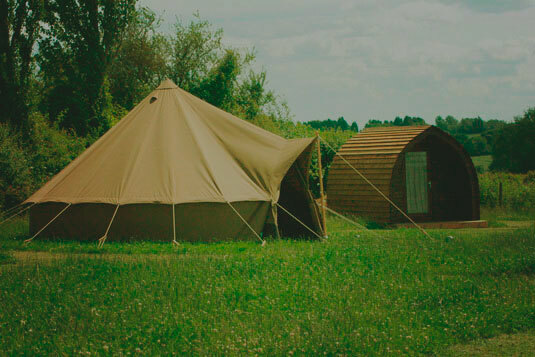 Our campsite offers a choice of either our wooden cabins or luxury bell tents. All have a double beds, feather down duvets and towels – with camp beds for children. There is so much to see and do in the area, one of the most visited in the whole of the UK. From Shakespeare’s Stratford to Warwick Castle or the honeyed beauty of the Cotswolds, you won’t be short of adventure.